Portia DeGeneres was born today, January 31, in 1973. She is known professionally as Portia de Rossi, an Australian and American former actress and model. She appeared as a regular cast member on the political thriller television series Scandal in the role of Elizabeth North from 2014 to 2017. She is also known for her roles as lawyer Nelle Porter on the American television series Ally McBeal—for which she won a Screen Actors Guild Award in 1999—and as Lindsay Bluth Fünke on the sitcom Arrested Development. She also portrayed Veronica Palmer on the sitcom Better Off Ted, and Olivia Lord on the TV drama Nip/Tuck. Her Instagram page describes her as a "former actress and now owner of General Public, an art curation and publishing company." De Rossi, born Amanda Lee Rogers in Horsham, Victoria, Australia. She grew up in Grovedale, a suburb of Geelong, Victoria, and modelled for print and TV commercials as a child. In 1988, at the age of 15, Rogers adopted the name Portia de Rossi, by which she remains best known. In 2005, she explained that she had intended to reinvent herself, using the given name of Portia, a character from William Shakespeare's The Merchant of Venice, and an Italian last name. She was educated at Melbourne Girls Grammar School and the University of Melbourne, where she studied law. Her first significant role was as a young and impressionable model in the Australian 1994 film Sirens. Soon afterwards she moved to Los Angeles, and won guest roles on several TV shows, and a permanent role in Nick Freno: Licensed Teacher, before landing a part in the film Scream 2. During this time in the United States, de Rossi worked diligently to replace her Australian accent with her current American one. She garnered international attention when she joined the main cast of Ally McBeal in 1998. She remained with the show until its end in 2002. In 2001, she starred in Who Is Cletis Tout? alongside Christian Slater. From 2003–06, de Rossi starred Arrested Development. She next impersonated John F. Kennedy, Jr.'s wife, Carolyn Bessette-Kennedy, in the made-for-TV movie America's Prince: The John F. Kennedy Jr. Story in 2003; then, in the same year, 2003, she acted out the role of an Australian reporter who inspires a protest against Frank Sinatra during a concert tour in The Night We Called It a Day. In 2005 she portrayed a fortune-teller named Zela in the Wes Craven thriller Cursed. From 2007–2008, de Rossi appeared in Nip/Tuck's fifth season as Julia McNamara's girlfriend. 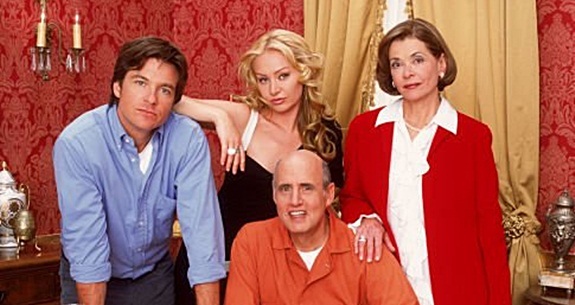 Six years after the series was canceled by Fox, filming for a revived fourth season of Arrested Development began in August 2012, and de Rossi reprised her role as Lindsay Bluth Fünke. This fourth season consisted of 15 new episodes, which debuted at the same time on Netflix in May 2013. Each episode focused on one particular character, with de Rossi's Lindsay featured in Episode 3, "Indian Takers," and Episode 8, "Red Hairing," and also appearing in several other episodes of the season. In July 2014, de Rossi appeared in Scandal. De Rossi joined Scandal in the fourth season in a recurring role, before being upped to a series regular for the fifth season. In April 2017, in season six, de Rossi's character was killed off by a golf club attack. De Rossi and Gregorini broke up in late 2004 because de Rossi began dating Ellen DeGeneres, whom she met backstage at an awards show. In 2005, she opened up publicly about her sexual orientation in interviews with Details and The Advocate. They were married at their Beverly Hills home on August 16, 2008. On August 6, 2010, Portia filed a petition to legally change her name to Portia Lee James DeGeneres. The petition was granted on September 23, 2010. She became a United States citizen in September 2011. In 2010, de Rossi published her autobiography, titled Unbearable Lightness: A Story Of Loss And Gain, in whose pages she wrote about the turmoil that she had experienced in her life, including suffering from anorexia nervosa and bulimia and being misdiagnosed with lupus. She had struggled with the eating disorders for 4 years while filming Ally McBeal. 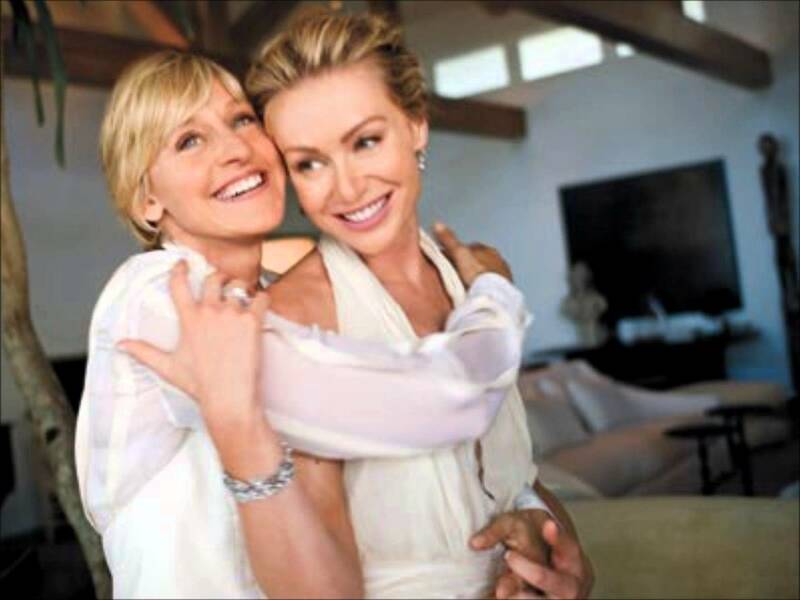 DeGeneres and de Rossi have both been vegans since 2008, and they have adopted several rescue animals. De Rossi supports a variety of charitable organizations, including Locks of Love, a group that provides human hair wigs (made from donated ponytails) for children with alopecia and other medical conditions that cause hair loss, such as chemotherapy for certain types of cancer. She has also supported fundraising efforts for FXB International, an African AIDS relief organization, and The Art of Elysium, an art foundation for terminally ill children. An avid animal lover, de Rossi also supports Alley Cat Allies, an organization dedicated to protecting and improving the lives of cats. As vegans, De Rossi and DeGeneres are strong supporters of the Gentle Barn, a California sanctuary for abused animals.